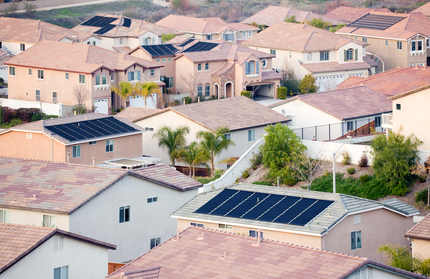 To many, how solar energy works seems like something out of a science fiction movie. But in reality we have been using solar energy since the dawn of time. Humanity has used it to make building materials, dry food and clothes, light our homes, cook food, purify water supplies, make fire and even to produce electricity. The process of turning solar power into usable electricity to power your home is an increasingly becoming more than just a novel idea. Energy prices are getting higher and people are looking for sustainable ways to cut on utility bills as well as save money. Solar Panels (photovoltaic cells), solar energy is produced when sunlight comes in contact with a photovoltaic cell, commonly known as a solar panel. The solar panels captures electrons from the Sun’s rays by filtering the Sun’s rays through a layer of phosphorus laced silicon and creating an electrical field between a boron laced layer of silicon and directing the current along an electrical pathway via a series semiconductor circuits to an inverter where it is converted to AC (alternating current). Mounting racks secure the panels in place on the roof and come in a fixed and a solar tracking variety. There are also pole mounted systems but most zoning laws require roof mounted systems. Most solar systems utilize an “array DC (direct current) disconnect” which enables you to disconnect your solar panels and inverter in the event needed maintenance. 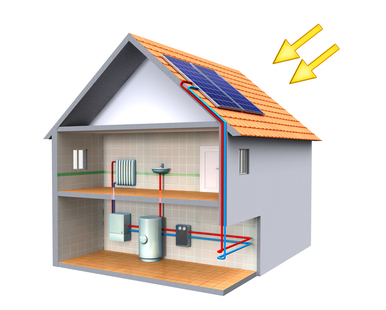 Solar energy systems also uses an inverter to convert your DC (direct current) power to a usable AC (alternating current) form to power your home’s lights and appliances. Battery banks are an optional addon, they are mostly used if you're living off the grid but may be utilized as a short term back up in the event of a power failure. If you are living off the grid it may be wise to have a gas or diesel generator as secondary backup as well. Utility meters measure the amount of electricity you use from the power company as well as energy you may supply back to the grid during low usage hours. There may be times when the meter is actually running in reverse when you are supplying more energy to the grid than you are personally using. The circuit panel is mutually connected to your home’s solar power system and utility meter and acts as a junction for your home’s power and separates your home’s power along various circuits as well as dividing 110V and 220V lines. 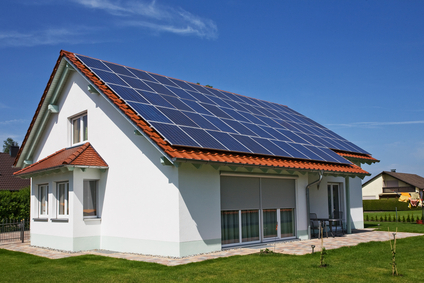 A solar power system in addition to energy efficient roofing will help you reduce energy costs.